The Chinese buy their 100th château in Bordeaux! The Chinese strategy has been to target estates in less showy appellations, particularly the Entre-Deux-Mers region. Furthermore, the attractiveness of the château building and grounds is a major factor in purchases. Only one classified growth is Chinese-owned: Bellefont-Belcier in Saint-Emilion. Curiously, the Chinese now own a huge chunk of the Fronsac appellation, with châteaux Richelieu, La Rivière, and Plain-Point. In the Médoc, the Chinese flag waves over Loudenne, Barateau, Bernadotte, Preuillac, Andron, and Les Tourelles. Mr. Naijie Qu from Dalian (northeast China) alone has 23 châteaux, totalling 500 hectares. That having been said, all Chinese holdings amount to just 1.5% of the total surface area under vine. There have been a few management problems and other difficulties due to the Chinese ignorance of French labor laws, but the trend continues unabated. Money talks in Bordeaux, and is worth noting the openness to foreigners as compared to the ruckus caused by the Chinese purchase of the Château de Gevrey-Chambertin in Burgundy, where they own next to no vineyards. Posted in Uncategorized and tagged Bordeaux, wine on January 26, 2015 by AlexR. 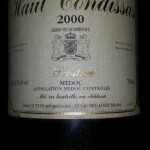 I’m having a whale of a time drinking many of my 2000 Bordeaux. There will always be people telling you to wait another couple of decades, to which I say “Bah, humbug !”. Of course, the very top wines may need that much time. But many, many wines of less exalted lineage are fine just now. 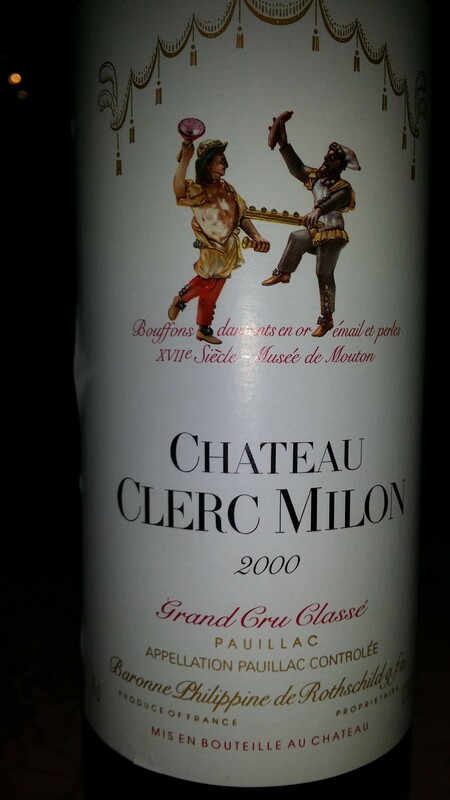 To wit, this 2000 Clerc Milon (40 hectares), a 5th growth from the Mouton Rothschild stable. I’ve always liked Clerc Milon and agree with conventional views that it is one notch above its brother, another 5th growth Pauillac, Ch. d’Armailhac (70 hectares), with which it is inevitably compared. This is reflected in the prices of the respective wines. I visited the new Clerc Milon cellar last year. It is built in a resolutely modern style on a rise directly overlooking Ch. Lafite Rothschild. Apparently, a new cellar is also planned for d’Armailhac in the near future. Back to the wine… 2000 Clerc Milon has a medium-deep colour and a bricking rim, looking slightly older than its age. The wine leaves thick legs on the glass. By the way, there is a common misconception that this is due to glycerine. However, I can remember a tasting tutored by the late Professor Emily Peynaud in which he said that this is incorrect: it is due to alcohol. The nose is not very pronounced. It is a little dusty with subtle hints of raisins and black fruit jelly. The wine is more interesting on the palate. It starts our round, then dips, and comes back with an assertive velvety tannic texture. It is warming, a little dry, and has a strong finish that even displays a little alcoholic hotness. The flavors include ethereal cherry-vanilla nuances and even some menthol/eucalyptus notes. The aftertaste is what makes this wine worthwhile. The textured tannin and grip also show that, although it has definitely entering its drinking window, it will stay on its plateau for a long time. In the galaxy of Médoc great growths this wine is middle of the road. But that’s still saying a great deal, and it is unquestionably a good, solid Pauillac. Posted in Uncategorized and tagged Bordeaux, Pauillac, Rothschild on January 18, 2015 by AlexR. The color is a rich deep golden yellow with bronze highlights. The nose is very fresh and fruity with quince and (decided) pear aromas, with some waxy nuances. The bouquet seems much more overripe than botrytized. The taste goes from round and unctuous into a finish with pronounced acidity. The aftertaste is pleasant, but on the short side. This is nevertheless a good wine to enjoy at this stage of its development. It is fresh and vital. 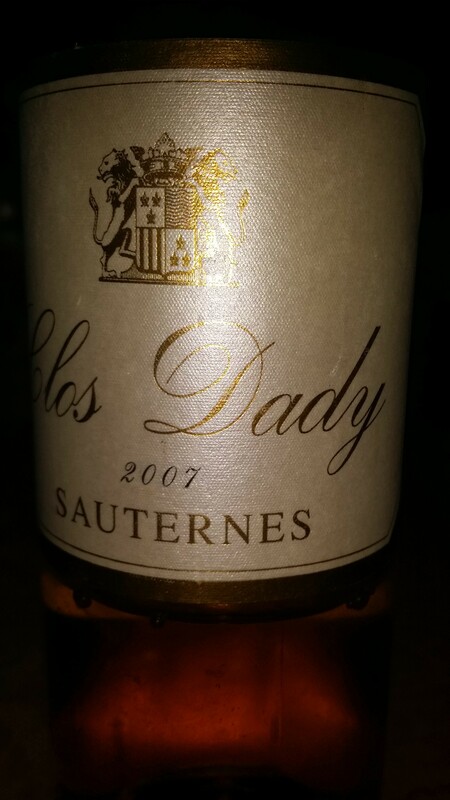 I am of the opinion that there is a style of Sauternes (like this) that appeals more to the French market, as opposed to the other kind (more botrytized, more concentrated, and oaky) that appeals to foreign markets. At table, even so, this Clos Dady was a treat. I expected much from the 2002 Ch. 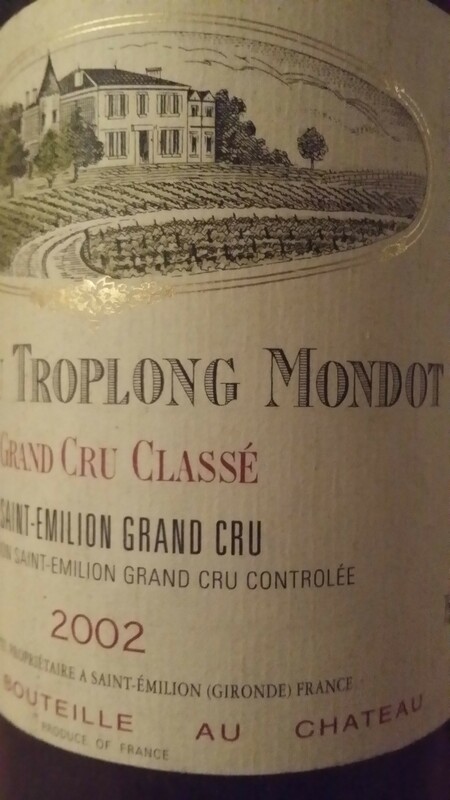 Troplong Mondot, a wine that I do not follow regularly, but which was promoted to Premier Grand Cru status in 2006 and confirmed in 2012. 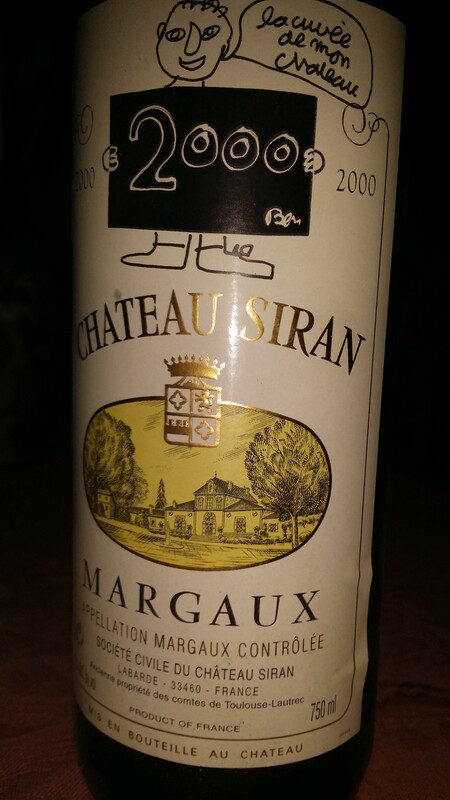 Aware that 2002 is not such a wonderful vintage, especially on the Right Bank, I was willing to make allowances. I was nevertheless disappointed with what I tasted. The color is lovely and deep, looking younger than its age. The nose has hints of leather and musk as well as a ferrous, and what I call a soy sauce element. It is ripe and shows candied fruit. Things unfortunately go downhill from there… The wine is simply steamrollered by the oak. 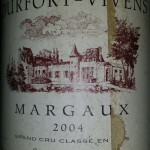 One of the great discussions among Bordeaux lovers is the “classic” versus the “modern” style. I freely admit to belonging more to the former camp. Still, I have an open mind. But when a wine is as overwhelmed as this by barrel ageing, you simply have to admit it. 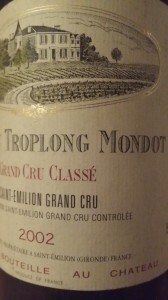 2002 Troplong Mondot is thus big and a little “hot” on the palate with a hard, dry, oaky aftertaste. It is curiously diluted on the attack, and then goes dumb and tight. The wine showed a little better after a few hours in the decanter, but it is going nowhere. Someone was a just a little too ambitious that year in light of the fruit’s potential. The last Troplong Mondot I had was a 1990, which was delightful, so I do not mean to paint every vintage with the same brush by any means. The Bordeaux rumor mill has been very active with news of a possible takeover of the estate since Christine Valette passed away last year, but these seem to be ungrounded. Posted in Uncategorized and tagged Bordeaux, Médoc, Saint Emilion on January 16, 2015 by AlexR. OK, I know this has nothing to do with wine, but the reaction was extraordinary here in Bordeaux. I remember what it was like when Mitterrand won the presidential election in 1981, and when France won the World Cup in 1998. But it was nothing like what we saw today. Posted in Uncategorized on January 11, 2015 by AlexR. I might add that he correctly identified a wine served blind on that occasion (château and vintage – it was an old Beychevelle). Jean is very different from your run-of-the-mill château owner. He is plain-spoken and a touch inconoclastic – which suits me just fine. He has got his hands dirty, built an empire of 200 hectares of vines from nothing, and made a great success. His commercial flagship is Château Rollan de By, an excellent AOC Médoc that is competitively priced and critically acclaimed. He also owns Château La Clare, Château Tour Seran, Château Greysac (which he bought from the Agnelli family of Fiat in 2012), etc. in the Médoc. Total production is approximately 1.3 million bottles. The cream of all this is Château Haut-Condissas, an AOC Médoc from Bégadan. This ten-hectare vineyard is planted with 60% Merlot, 20% Petit Verdot, 10% Cabernet Sauvignon and 10% Cabernet Franc. Being somewhat of a doubting Thomas, I wanted to see for myself, of course. 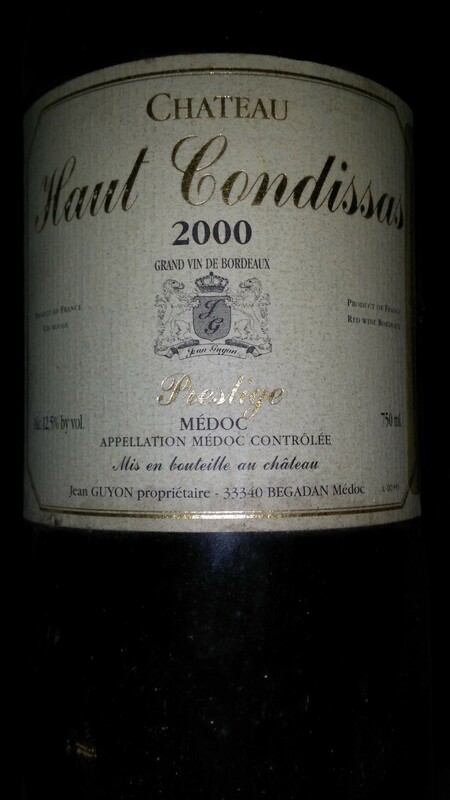 I had bought a bottle of the 2000 Haut-Condissas at Auchan in the Mériadec shopping center in Bordeaux some time back and decided to open it on New Year’s Day 2015. I figured that fourteen years should let most any wine show most of what it has to deliver. Well, the experience was more positive than I expected. The color is so deep that I had trouble decanting the wine. The rim is only just starting to brown, making the wine look younger than its age. It also leaves thick sheets on the side of the glass. The nose shows hints of candied black fruit, cranberry, blackberry jelly, untanned leather, meat, and crushed blackcurrant leaves. As good as the bouquet is, the wine is even better on the palate, which is chock full of fruit. The tannic texture is coarse-grained, but velvety, and the structure develops effortlessly from spherical into the assertive and penetrating flavour of classic Médoc. The aftertaste is maybe a little short and there’s a certain dryness there, but nothing puts this into the artificial, “manipulated” category. The alcohol content is 13.5% and this comes through in the flavour profile, but does not overwhelm… I would rate the wine 15.5/16 out of 20, keeping in mind that my scores are systematically lower than most other people’s. 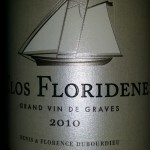 I enjoyed two Bordeaux wines on Sunday, starting off with 2010 Clos Floridène, a white Graves from Denis Dubourdieu who has a number of claims to fame: Dean of the Institut des Science de la Vigne et du Vin, well-known consultant, owner of several estates in Bordeaux (including the great growth Doisy-Daënes in Barsac), and acknowledged authority on the making of white wines. It is fine to drink now, but will hold for years. Furthermore, the wine was even more aromatic, without a loss of freshness, the next day. 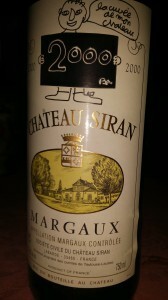 By the way, the label has changed with the 2007 vintage, if none of you has seen it: http://www.durfort-vivens.fr/blog/index.php?post/2010/02/06/Bienvenue-sur-Dotclear%C2%A0! Posted in Uncategorized on January 7, 2015 by AlexR.